The following is a guest article by Ben Kerson, who lived and worked for an American NGO in Tunis, the capital of Tunisia, for two years. Kerson reached out to nearly two dozen Tunisian citizens for their take on recent events. Ben Kerson currently lives in New York City. We welcome your comments, feedback, and any social sharing of this report, which brings to light personal perspectives and insight on these events that are available nowhere else, online or off. Photo by Alexis Madrigal, senior editor at The Atlantic, used with permission. On January 14, 2011, Tunisia became the first Arab nation to expel its leader through a popular revolt. For 23 years, Zine el-Abidine Ben Ali ran Tunisia as a tightly gripped police state, where minor advances in quality of life were at the sacrifice of basic civil liberties. The unrest began a month earlier, on December 17, 2010, when Mohamed Bouazizi, unemployed and university-educated, doused himself in paint thinner, and set himself aflame. In doing so, he put a face on decades of fermented dissatisfaction, and instigated countless Tunisians to voice their outrage at the state of their union. A rally was subsequently held in his hometown of Sidi Bouzid, calling for the creation of new jobs. Over the next two weeks, two more young men committed suicide, and several more protests were held. Tunisians were fed up with the lack of opportunities, increasing food prices, escalating taxes, and the bribe-based system of social mobility that Ben Ali and his corrupt regime had established. By early January, the strikes and protests had moved from the impoverished countryside to Tunisia’s main economic centers. As events intensified, each rally resulted in numerous casualties, as Ben Ali employed what many in the world community condemned as excessive military force. At the point when demonstrations reached the nation’s capital, Tunis, protesters had stopped calling for policy changes, and started calling for President Ben Ali’s removal. On January 14, Ben Ali absconded to Saudi Arabia. In just under a month, the people of Tunisia had successfully brought down their dictator. The global media was quick to brand it a “Twitter Revolution” or “WikiLeaks Revolution.” Taking a cue from a pair of 2009 Twitter-fueled demonstrations in Iran and Moldova, the international press sought to highlight the role of social media in launching the anti-government protests in Tunisia. According to Elizabeth Dickinson at ForeignPolicy.com, while some journalists stuck with classifying Tunisia’s protests as a “Social Media Revolution,” other reporters disputed that. Editorials appeared claiming — rightfully so — that to call the situation in Tunisia a Twitter, WikiLeaks or social media revolution would undermine the actual cause of protest: the years of suppressed frustration and the fraudulence of Ben Ali’s regime. It is a salient point, as the roots of Tunisia’s indignation indeed lie in the lack of opportunity and the government’s abuse of power. But the roots of Tunisia’s uprising? Those are online. Currently, journalists struggle to strike a proper balance between social issues and social media. However, in doing so, many are failing to understand the role of the Internet in Tunisia’s uprising. I spoke with nearly two dozen Tunisian citizens on this subject, and collected their responses. 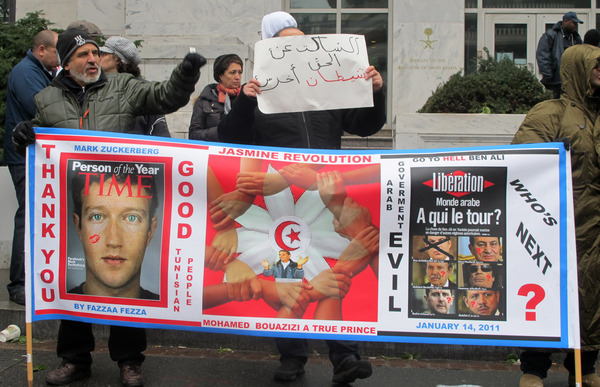 It’s glaring just how vital the Internet was to broadening this Tunisian revolt. To underwrite the role of social media in the toppling of Ben Ali’s regime would be a fallacy; perhaps Mr. Wedeman (@benCNN) should “friend” some Tunisians. Prior to the uprising, Tunisia had long been considered the most stable country in the region. However, beneath the veneer of its resort hotels and zones touristiques, was a population deeply unhappy with their leadership. A purported democracy, Tunisia was run without many of the tenets of a free society. Elections were falsified, public assembly was banned, and perhaps most crippling, there was no free press. When it came to information, Ben Ali’s control was rampant. He maintained a zero-tolerance policy on dissent, and many anti-government journalists were notoriously imprisoned. In their most recent Press Freedom Index, out of 178 countries, Reporters Without Borders ranked Tunisia at 164. The government’s version of news hardly resembled journalism. The joke was, that no matter what was happening in the country, Tunisian newspapers only ran one article: Ben Ali is doing a fabulous job. So ludicrous was the extent of government censorship that nightly news programs would air video of dancing children. Over the years, Tunisians learned to ignore the mainstream media. News on Facebook was immediate. As events unfolded, the site was crucial in spreading information. Mohamed Nafti, a 33 year-old doctor in Tunis (who provided the images included in this post), told me how he “was sticking by Facebook day and night.” Written personal accounts, images, and video captured on mobile phones flooded the site. In turn, an atmosphere emerged where, for the first time in their lives, young Tunisians voiced their opinions. Ms. Ben Slimane, who grew up in the northern city of Bizerte, recalled, “Comments were said without fear… We knew that we were all suffering from the same problems.” The discontent ran deep, and social networking fostered a newfound unity among the youth of Tunisia. As protests continued over the next three weeks, so did police violence — the echoes of which were amplified online. A demonstrator shot by the police would appear on Facebook’s newsfeed before even arriving at the hospital. “The most important video I saw showed the massacre in Kasserine,” Ms. Masmoudi said, referring to a rally on January 8, in which six protesters were murdered by Tunisian authorities. “This kind of video couldn’t be seen on Tunisian television,” she added. It was that solidarity that changed the rhetoric of the protesters: Where Tunisians first demanded more jobs, they ultimately began demanding a new government. 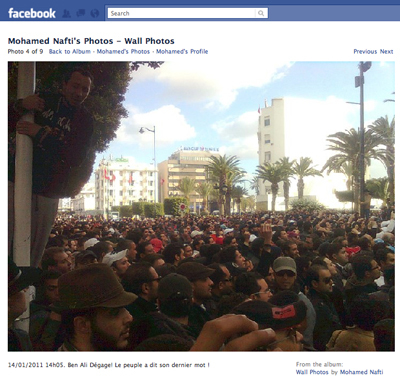 And, as the people of Tunisia came together online, so did they in person. Numerous protests were planned on Facebook, several of them in synch around the country. According to Slimane, “People could make plans to protest in different cities at the same time, which made it difficult for the government to control.” Such was evident early in the struggle, on December 25, 2010, when three separate rallies were held in different cities across the country simultaneously. To a logistical end, Facebook was “definitely the strongest tool,” Ibrahim Ben Slama explained. The site was integral to the organizing of actual demonstrations. 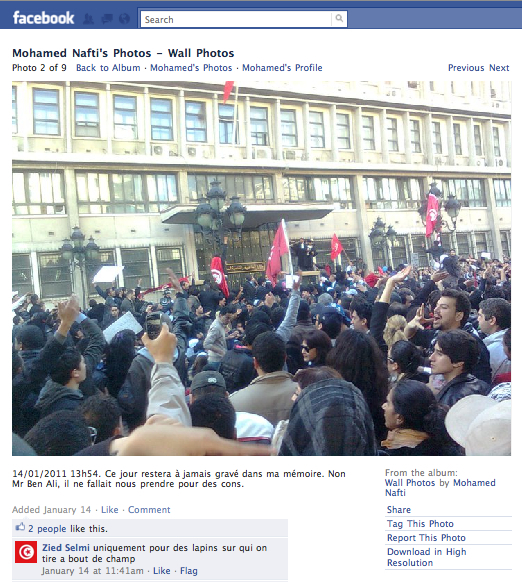 In fact, the January 14th protest in Tunis — the decisive rally during which Ben Ali fled the country — was organized the night before as a Facebook event. 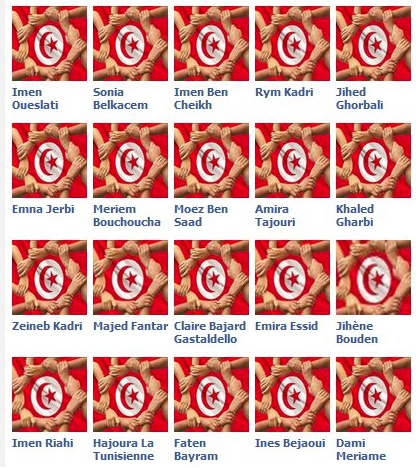 Many Tunisians changed their Facebook profile pictures in solidarity. Here, an image of Mohamed Nafti’s Facebook friends with recently updated profile pictures. Seventeen percent of Tunisia’s population is under 35, according to Ranjit Lall and Robin Wigglesworth at the Financial Times, which is a lower figure than in most Arab countries. Nonetheless, the country is home to an increasingly tech-savvy minority. This fluency with new media has enabled young Tunisia to level the firewalls of its dictatorship. It has created a generation that refuses to accept the official word of a police state. Featured photo by Alexis Madrigal, senior editor at The Atlantic, used with permission. Images from the Facebook Wall of Mohamed Nafti, used under with permission.